Archives : NOT A REVERSAL., JUST A PULL-BACK - 11/09/2015. NOT A REVERSAL, JUST A PULL-BACK - 11/09/2015. The market witnessed a pull-back after making fresh lows in the beginning of the week. After making a low of Nifty 7539, market bounced back to close the week on a positive note. This upward move can be termed as a mere Relief rally and not a Reversal of the Trend. 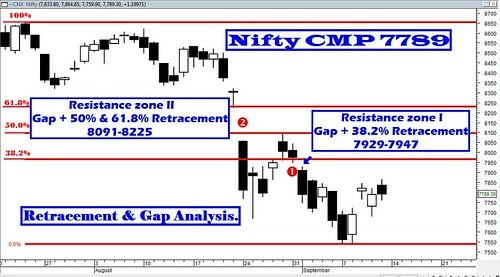 Relevant retracement levels for the short term are placed at Nifty 7815 – 7880. Despite this rally, the trend remains bearish and it still is a sell on rise market. Sensex opened the week at 25302, made a high of 25875, low of 24833 and closed the week at 25610. Thus it closed the week with a gain of 409 points. At the same time the Nifty opened the week at 7685, made a high of 7864, low of 7539 and closed the week at 7789. Thus the Nifty closed the week with a gain of 134 points. On the weekly charts, both the indices have formed a Bullish Harami pattern. This is a bullish reversal pattern which requires confirmation. 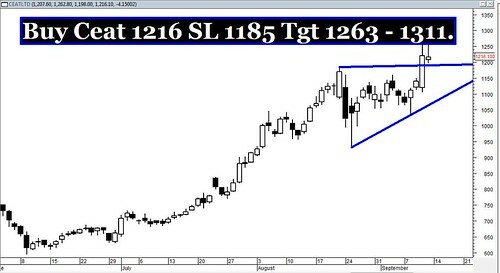 On the daily charts, both the indices have formed In-Neck Pattern which is a continuation pattern. Thus daily and weekly candlestick study suggests a bullish bias in the near term. This week’s upward movement is a more of a relief rally and not a Reversal of the trend. The very short term pull-back levels are placed at Sensex 25760-25979 and Nifty 7815-7880. If the current rally gets extended then we will need to take the retracement of the fall from Sensex 28578 and Nifty 8654. The corresponding Correction levels are Sensex 26264-26706-27147 and Nifty 7965-8097-8228 for the Nifty. Both the indices have recorded two Bearish Gaps in the current fall. The first gap between Sensex 26141-26215 and Nifty 7929-7947 will act as strong resistance in the near term. On the higher side there is another Bearish Falling Gap on daily as well as weekly chart i.e. between Sensex 26730-27131 and Nifty 8091-8225, which will act as a strong Resistance zone going forward. After achieving the target for Bearish Rising Wedge, this week saw both the indices achieving the target for Ascending Broadening pattern (which was at 25034 for the Sensex and 7533 for the Nifty). Now the indices are on course to achieve the targets for Head and Shoulders pattern (Sensex 24486 and Nifty 7425). Two weeks back a higher degree Head and Shoulders got completed and the target as per that pattern falls at Sensex 22552 and Nifty 6741. MACD has just signalled a fresh buy, whereas RSI (40) suggests continuation of bearish momentum. MFI has just crossed the centreline, indicating fresh buy. Stochastic oscillator continues in Buy mode as %K remains above %D. ADX @ 42 suggests that the current down trend is very strong. Directional indicators continue in Sell mode. Bollinger Band continues with its Sell signal. Thus Oscillators are presenting a mixed picture. This week, both the indices continued to remain below the short term average of 20dma (Sensex – 26214 and Nifty – 7956), the medium term average of 50dma (Sensex – 27294 and Nifty – 8275) and even the long term average of 200dma (Sensex – 27825 and Nifty – 8415). Thus the trend in the short term, medium term and even the long term timeframe continues to remain bearish. Options data for September series indicates highest Put Open Interest build-up at the strike of 7500 and highest Call build-up is now at the strike of 8000. Thus Option data suggests a wide trading range with support coming in at 7500 and resistance around 8000.